Betty and I flew to Tampa, and visited our catamaran, the SV Aphrodite, for the first time today. It was very exciting to see her in person, and tonight is our first night sleeping aboard. I managed the first hurdle, which was to actually get on board the boat with my non-stretch, unforgiving MEC rad pants. These pants are distinctly retro. So much so that even MEC admits that they were sartorial blunder. But, with their baggy bum, and bright colors, they are oh-so comfortable. I will be sad to part ways with them but they are not suitable for sailing. I am now wearing Nike running shorts and plan to live in them for the next couple of days, until we return home to Ottawa. After spending some time on the phone with my husband as we discussed how to get the electrical components to work, I finally bent and asked for help from someone at the marina. My helper admitted that he wasn’t too familiar with boats, but he could manage all things electrical. So, he flicked the breaker at the electrical outlet on the dock, and we had air conditioning. Fantastic! I thought we were going to have to suffer through the 86 degree heat that was baking the interior of our saloon. Betty’s experience at the marina was a little different. She had no trouble getting onboard at all. 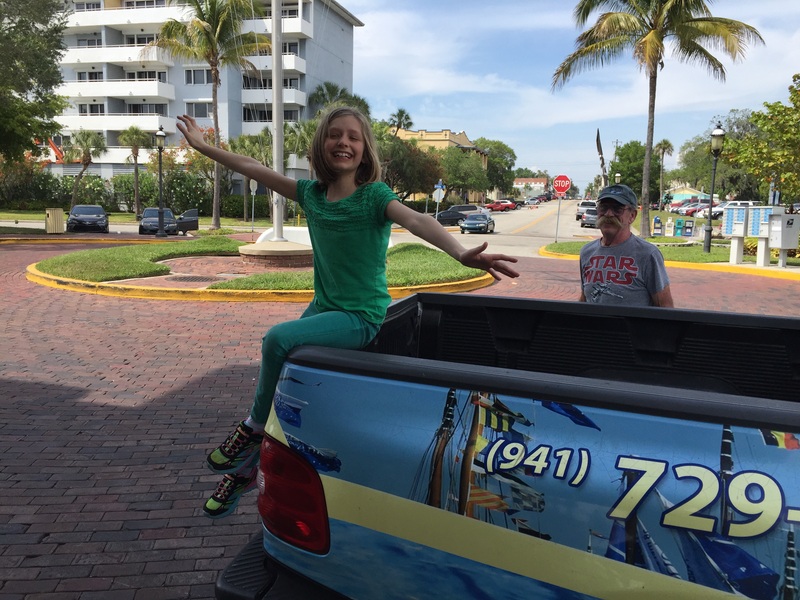 And, I had trouble containing her excitement as she launched herself off the sugar scoops with only her upper body visible above the boat. Her jeans, t-shirt and shoes were soaked, and she managed to get her change of clothes wet too. So, now her clothes are hanging every which way about the boat, set our to dry. 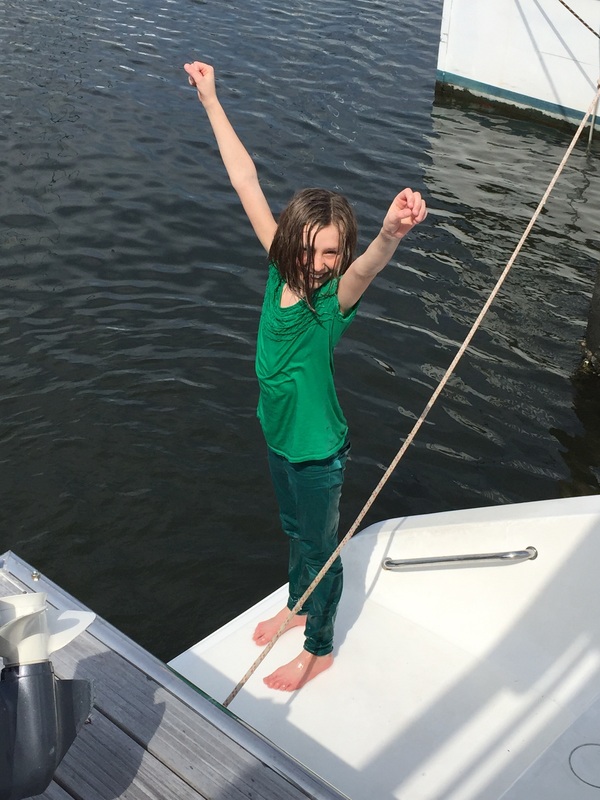 She also used the top of the boat as a slide, declaring with glee that we had solar panels. And, I watched her fire herself down the saloon windows more times than I found to be pleasant. She is extremely nimble on the deck and told me that she invited a man aboard to check out our boat. She said that he declined. Betty was excited to be in Florida – she said that she had forgotten what summer looked like. She loved the palm trees, and a plant called old man’s beard – this strange, grey, sea grass like plant that adorns many trees in this area. She also picked flowers, introduced herself to every dog at the marina, met old people, and attempted to hitch a ride on the marina trolley by herself. 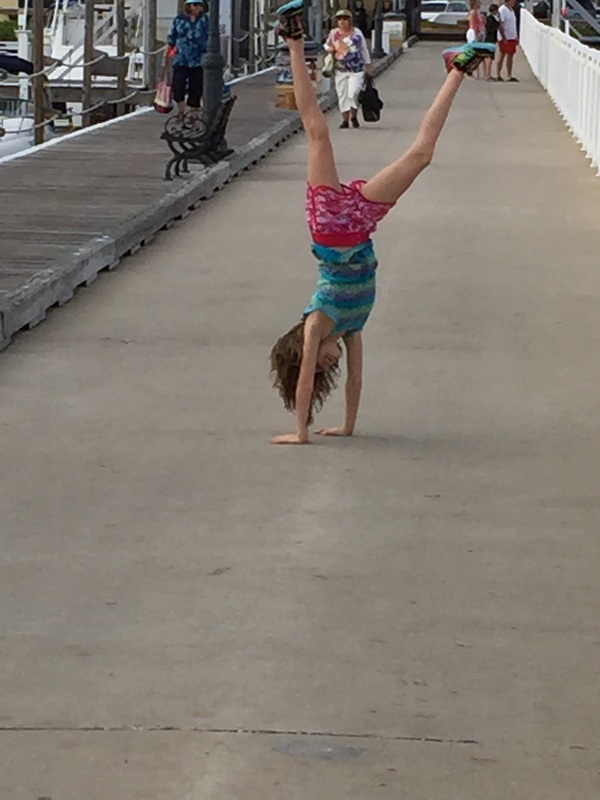 She did cartwheels on the docks, and waved to people through our saloon windows. When we left Ottawa, it was snowing. Here it is hot, and I am going to enjoy a shower tomorrow morning. Marina life feels a bit like camping, but kind of higher end – in that, at this marina, there is valet parking and restaurants where we are. It won’t always feel that way, I’m sure, as we don’t plan to anchor at marinas on a regular basis, preferring something more off the beaten track. Here I am very conscious that I’m moving albeit slightly all the time. I feel like I’ve had a bit to drink. I wonder – is that a common sensation to those new to sailing?